Don't know your date? Get a gift certificate! Book your 1-Day Rally School now! Our rally schools are 1-5 days in length. Day one of the course takes place on either our South or North End slalom and skidpad training areas using our fleet of Ford Fiestas. On day one we teach you the basics of car control, left foot braking, weight transfer, controlling wheel spin and lockup, managing understeer and oversteer, practicing threshold braking, and controlling your eye placement. Click here to view a short video. After you’re done with the day’s exercises, you’ll get some right-seat hot laps around some of the facility roads with an expert instructor behind the wheel, a great fun end to the day and an excellent introduction to our more advanced courses. We close the day with a rally-based mechanics class, designed to give novices and experts alike a solid foundation to the unique challenges a vehicle faces when driven at high speeds on loose surfaces. Our courses are progressive, this means if you complete less than 5 days you can return at a later date and pick up where you left off to finish your experience and training. You may never get into rally racing, but driving a rally car will give you the confidence you need to drive at the limit in any race car, and will prepare you for drifting, rallycross, track days, road racing, winter driving, stunt driving, or anything else you may do behind the wheel of a car. Our 1-Day Rally School is also the perfect activity for a group event, VIP experience, team building, bachelor party, or any other special event you may be planning. We do offer group discounts, and the Littleton, NH area offers world-class dining, lodging, attractions and tax-free shopping. 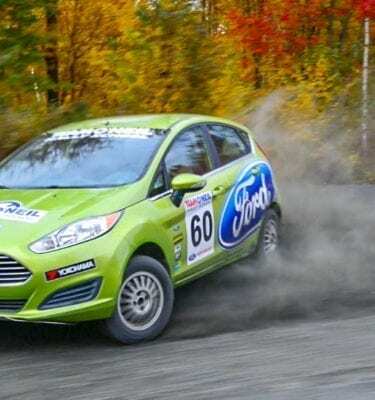 Our courses include use of our fully prepared rally cars, all required safety equipment, personalized course handbook, damage coverage on our vehicles, lunch/drinks/snacks, certificate upon course completion, individualized photo, and all of our rally school students receive a $30 credit towards official Team O’Neil Rally School merchandise. We also offer photo and video packages upon advance request. Click here to learn more on how to prepare for your visit. SELECT THE NUMBER OF PEOPLE AND YOUR START DATE AT THE TOP OF THIS PAGE. 603-444-4488 or email info@teamoneil.com if you have any questions. Improvements include: Hawk PC front pads, Koni adjustable sport dampers, Shroth safety belts, 6061 Aluminum skid plate, Method Wheels, winter tires, Quaife ATB Limited Slip Diff, Rally Armor flaps, Wilwood Proportioning Valve, 5/8 Master Cylinder with assist delete, ABS/DSC disabled and roll cages on cars used on days 3-5.